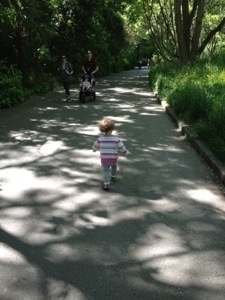 T-Bone and I spent the morning at the zoo with about 2000 other kids and their chaperones. That’s not an exaggeration. I overheard one of the zoo staff say they were expecting that many kids in school groups today. Way to pick a day to go to the zoo, Curly. 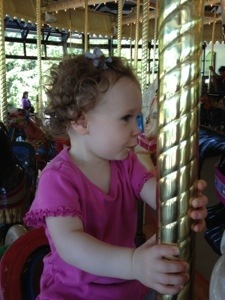 She also got to ride the carousel for the first time ever! She was quite intrigued by it and was excited to get on, but then it took longer than she wanted for it get going and started to fuss and tried to get down. I managed to keep her on her horse for the few more seconds it took to start going around and her mood changed in an instant. Huge grin and giggles galore. It was sad when we had to leave. We will definitely be visiting the horses again. 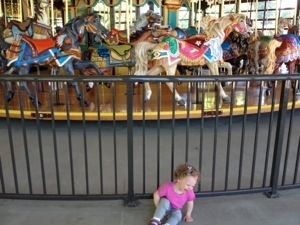 Her oldest cousin loved riding the carousel when he was little, too. I bet he could be persuaded to join her. I showed grandma and grandpa your updated photos. They loved the new photos of T-Bone.